Fabric: 80G non-woven fabric, Soft, Sturdy and Environmental. Can be use many years. It has 2 sides, one side is 30 pockets, another side is 17 hooks. 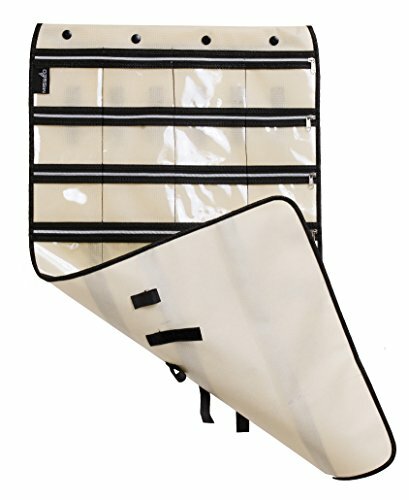 Pockets size details: 24pcs small pouches L 4"/H 2.7", and 6pcs large pouches L 5.5"/H 4"
Three rows loops, total 17 pcs hooks and loops fastener closure, easy to use. The transparent pockets make it easy to see items even in a dim closet. This zipper jewelry organizer is perfect for women girls to stores pendants, earring, rings, chains, watches, bracelets, headwear. hair accessories, etc.